10. University of Auburn – $106 millionWidely recognized as the noted archrival of the University of Alabama, the Tigers get more than $35 million from licensing contracts, television contracts (CBS and SEC). Their budget also includes more than $4 million paid by the students themselves to support the program. 9. University of Oklahoma – $108 millionA big player in the college football world, the University of Oklahoma has consistently stayed in the Big XII, despite contradicting rumors. The Sooners managed to generate a fabulous $108 million in profits in 2012, mainly from television contracts and donations. They are also famous for being the Sports Illustrated third best football program in 2002. 8. Pennsylvania State University – $110 millionPSU was involved in the child abuse scandal that cost Joe Paterno his job in 2012, but still managed to be one of the richest programs in the country. The Nittany Lions are just recovering from the scandal and are expected to reach their previous top spot as soon as possible. 7. Louisian State University – $115 millionEven though LSU doesn’t impose any athletic fees to their students, it has a huge revenue from the alumni and local companies, as well as license profits and ticket sales. The Tigers are also one of the most profitable teams in the country, having a net profit of approximately $17 million in 2011. 6. Texas A&M University – $120 millionWith a staggering $35 million in revenue from ticket sales alone, the Texas A&M University sits on the top of the list when it comes to profitability. The Aggies also has important revenues from television licensing contracts and reported a record $38 million profit at the end of 2012. 5. University of Florida – $122 millionThe Gators netted $120 million in revenue during the last fiscal year, with $46 million coming from the alumni and local companies and $42 million from licensing contracts. The state of Florida has also poured $5 million into the program’s account and a large amount of income is generated by the popular apparel and memorabilia products. 4. University of Alabama – $125 millionThis southern team earned a total of $125 million in revenue during the last season. Their budget consists of more than $30 million coming from alumni and local companies and more than $35 million coming from ticket sales. The football program also donated $7 million to a variety of academic programs. 3. University of Michigan – $140 millionThe school’s football team generates $45 million from ticket sales alone, thanks to its Michigan Stadium, which can fit 109,000 spectators. The Wolverines also get more than $12 million from licensing and advertising contracts. 2. Ohio State University – $142 millionOSU’s famed football program has managed to get a total revenue of $142 million in the last fiscal year, and their stadium, which can fit more than 102,000, has some of the highest occupancy levels in the country. The program receives more than $51 million from donations and alumni, and another $44 million from licensing, advertising and merchandise contracts. 1. 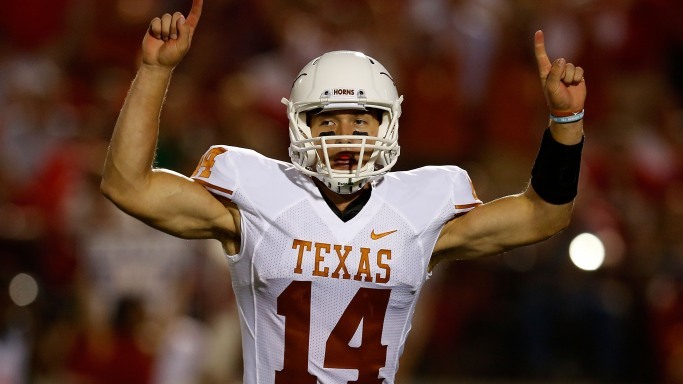 University of Texas – $163 millionThe richest football program in the country is, by far, the University of Texas program, which consistently generates more than $150 million every year. The Longhorns are also successful on the field, which helps them tremendously, netting them $56 million from ticket sales alone. The profits of the program reached $25 million, an impressive sum, considering that the university doesn’t impose athletic fees to their students.